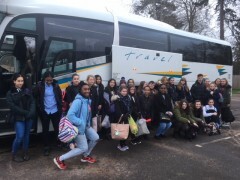 7am today .....Churchmead students were very excited and raring to go on their French trip to Rouen, the beautiful capital of Normandy! On route they will be stopping off at Le Touquet (Paris by the Sea) and upon reaching Rouen will be joining their partner school, College Le Cedre, for French lessons and other activities. Wishing them all a safe and fun trip!